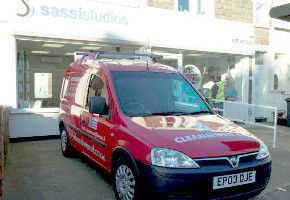 Gleaming windows are a reflection on your business… and on ours. With Cleansheen you can count on immaculate results every time and a reliable, professional service. Cafés, pubs and restaurants… shops, galleries and salons… as a small Bristol business ourselves, we support local companies and understand their needs. 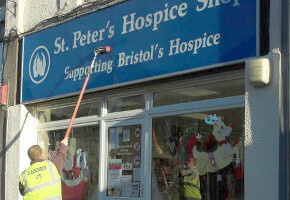 We were delighted with the efficient and cheerful way that you cleaned the 80 windows of our church. Cleansheen ltd has done the cleaning at our offices and also at our home. We have found the staff to be courteous and trustworthy, while their work has been of a very high standard. We have already recommended Cleansheen ltd to our contacts. We have been happy with the professional & friendly service you provide. Image is everything in our business, you are helping us keep things looking right. 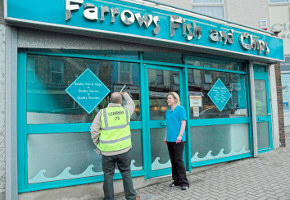 Being an award winning chip shop our standards are high that is why we use Cleansheen limited to clean the windows and signage of both our shops located on Totterdown Hill & the precinct St George. We have been using this company for the last 24months and found Cleansheen Ltd to be a highly professional and efficient team and they clean all three of our shops in Bristol area. Cleansheen have been doing an excellent job in keeping my windows clean. their friendly manner and attention to detail make them stand out. I would reccomend them to everyone. For office window cleaning as well as schools, churches, shops, pubs and restaurants our modern equipment provides a superior clean without the use of ladders. It works on a system of telescopic poles fed by purified water, with no added chemicals or detergents. It is safer than traditional methods, much more efficient and doesn't get in the way of your business or your customers. 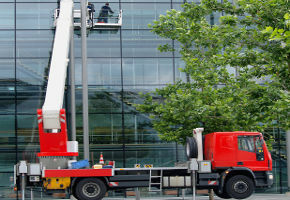 For buildings over 65ft high, we use high-access platforms such as boom lifts and scissor lifts, so that your premises sparkle from top to bottom. We always follow rigorous safety procedures and wear hard hats and harnesses where appropriate. Risk assessment is the cornerstone of effective Health and Safety management. Our professionally trained window cleaners all have Risk Assessment accreditation and are covered by Public Liability Insurance. We are also High Level IPAF Accredited and have Working at Heights certification. Is your signage a little grubby? 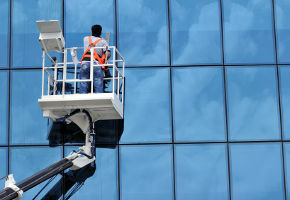 Book Cleansheen today for your commercial window washing and have your first signage clean-up for FREE.